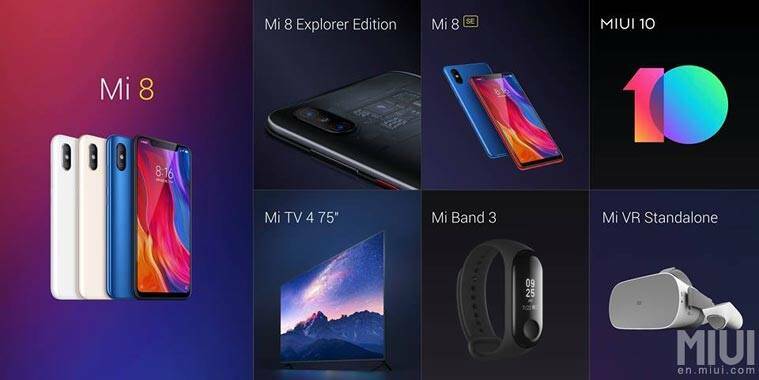 Xiaomi Mi 8, MIUI 10, Mi Band 3 launch Highlights: Mi 8, Mi 8 SE, Mi Band 3, Mi 8 Explorer Edition, Mi TV in 75-inches and Mi VR headset revealed. Xiaomi Mi 8, MIUI 10, Mi Band 3 launch Highlights: Mi 8 gets notch display, there’s a Mi 8 Explorer edition as well with a transparent back. Xiaomi Mi 8, Mi Band 3, Mi 8 SE, Mi 8 Explorer Edition, MIUI 10, a new Mi TV 4 in 75-inches and a Mi VR headset were announced at the company’s annual product launch event in Shenzhen, China today. Xiaomi CEO Lei Jun hosted the keynote, which kicked off at 2 PM local time (11:30 AM IST). The company had a livestream for the event on its China website as well. The highlight of Xiaomi’s event is the Mi 8 flagship smartphone, which has been announced in three different editions. Mi 8 is the anniversary special smartphone from the company. 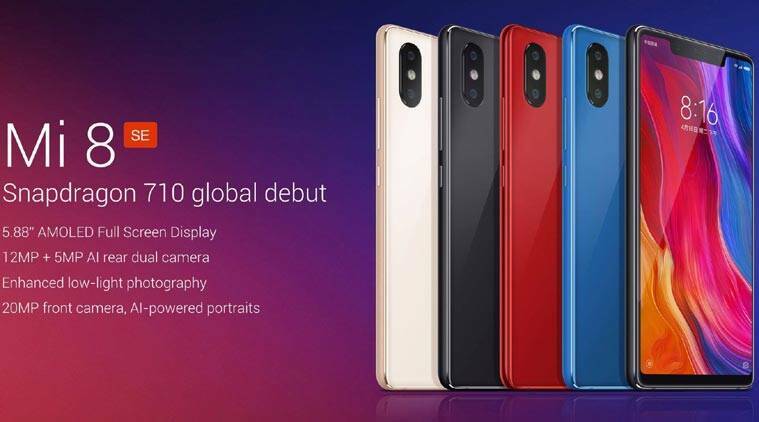 The Mi 8 has a notch style display with advanced facial recognition system like Apple iPhone X.
There’s also a Mi 8 Explorer edition, which is more expensive and features a 3D facial recognition system and a completely transparent back. Xiaomi has also introduced an in-display fingerprint scanner on the Mi 8 Explorer edition. The regular Mi 8 has a fingerprint scanner at the back of the phone. Mi 8 has an aspect ratio of 18.7: 9, and the same display style is followed on the Mi 8 Explorer Edition and the Mi 8 SE. The SE variant runs the Qualcomm Snapdragon 710 processor and comes with a 12MP+5MP rear camera. The bigger Mi 8 and Mi 8 Explorer Edition both have a 12MP+12MP camera setup on the back. All three phones have a 20MP front camera. 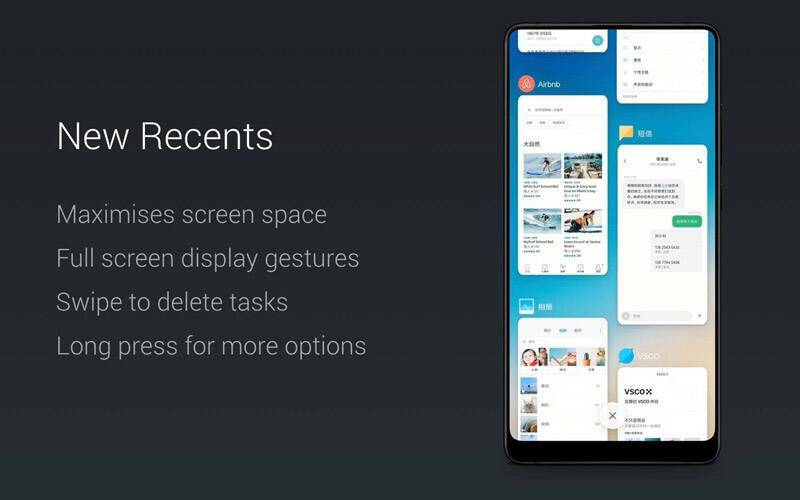 MIUI 10, which is the company’s latest custom UI, has also been introduced with a revamped task manager, boost in performance as well as gesture controls. MIUI 10 also comes with AI-based features and support for Bokeh photos on dual and single sensor cameras. Meanwhile, Mi Band 3 now comes with 5ATM water resistance, a bigger 0.78-inches display and a 110 mAh battery. Xiaomi has also revealed a standalone Mi VR headset in partnership with Oculus and powered by the Qualcomm Snapdragon 821 processor. Mi TV 4 in 75-inches has a 4K HDR display coupled with 2GB RAM and 32GB storage. Read on for live updates and details from the event. The Mi TV 4 with 75-inches display panel has a price of Yuan 8999. This comes to nearly Rs 94,000 plus in terms of pricing. The Mi TV 4 has a 4K HDR display, 2GB RAM, 32GB storage space, support for Dolby Atmos, comes with a 64-bit quad-core processor. There's also an AI-enabled voice asssitant for the Mi TV 4. Coming to the Mi 8, the smartphone has a 5.8-inches display which is also an AMOLED one from Samsung. Just like the Xiaomi Mi 8, the Mi 8 SE also has a notch on the front. However, this is a more affordable variant of the Mi 8 and comes with the Qualcomm Snapdragon 710 processor. This is the first smartphone to launch with the new Qualcomm processor, which offers features usually seen on the high-end 800 series processors from the company. Mi 8 SE will come in two editions: 4GB RAM + 64GB storage or 6GB RAM and 64GB internal memory. The Mi 8 SE sports a 12MP+5MP dual camera setup on the back, while the front has a 20MP selfie camera, which is powered by AI. Mi 8 SE starts at Yuan 1799, which is nearly Rs 18,971 for the 4GB RAM and 64GB version, while 6GB RAM option will cost Yuan 1999, which is Rs 21,080. Mi 8 will go on sale from 5, June 2018 in China. The starting price is Yuan 2699 for the 6GB RAM and 64GB version, the 6GB RAM and 128GB version will cost Yuan 2999 and the 6GB RAM+ 256GB version will cost Yuan 3299. In India, the starting price comes to Rs 28,000 plus for the 64GB variant, the 128GB variant is Rs 31,000, while the 256GB variant will cost Rs 34,000 plus when the price is converted. We will have to wait and see if Xiaomi launches Mi 8 smartphone in India and at what price. Xiaomi has already indicated the Mi 8 will come to global markets and India will likely be on the list. Mi Band 3 has a price of Yuan 169. The band has a 0.78-inches OLED display with 120x 80 pixels resolution, 4.2 Bluetooth LE support, 110 mAh battery compared to the 70 mAh on the Mi Band 2. It has 20 days plus battery life, which is similar to the previous variant. The water resistant rating 5 ATM, which means it will waterproof till 50 metres of water and can be taken for swim. The highlight of the event is the Mi 8 smartphone, which sports a bigger 6.21-inches AMOLED display from Samsung and has a notch on the front. The Mi 8 has a dual 12MP+12MP rear camera and comes with AI features for photos. It has an Infrared sensor for Face unlocking as well. There's also a Mi 8 Explorer edition which has a transparent back, 8GB RAM and 128GB storage, an in-display fingerprint scanner, coupled with a 3D face recognition feature for unlocking. Then there's a Mi 8 SE which has a Qualcomm Snapdragon 710 processor, a smaller 5.8-inches Full HD+ display. All three phones have a notch on the front. 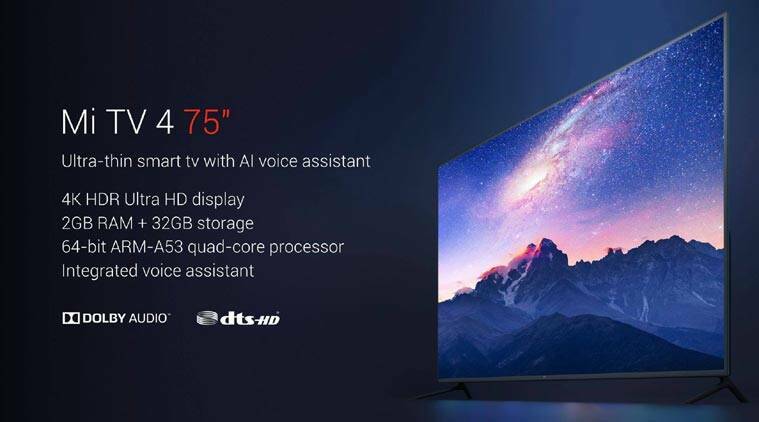 Xiaomi has also launched a Mi TV in 75-inches, a new Mi Band 3 and a Mi VR headset, which is a standalone one in partnership with Oculus. The Mi TV 4 in 75-inches has an ultra-thin design, 4K HDR display, 2GB RAM and 32GB onboard storage. Mi VR headset with Oculus has a price of Yuan 1499 for the 32GB variant. The 64GB variant will cost Yuan 1799. No word on whether this will come to global markets. The company claims Mi Band 3 is totally waterproof. It is waterproof up to 50m, and allows users to stay connected while they are swimming. 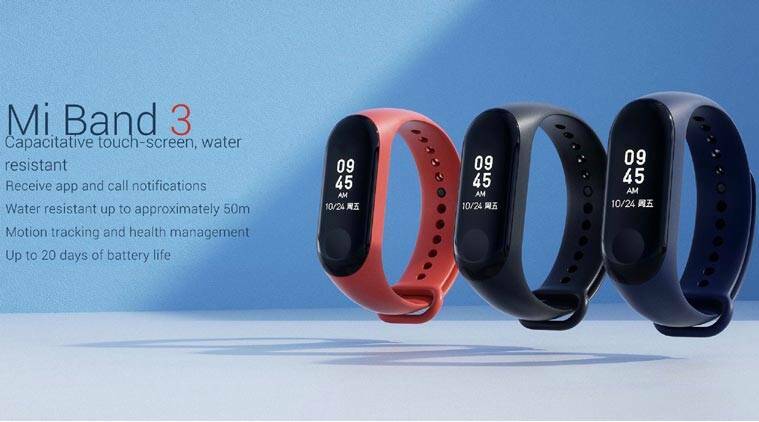 Mi Band 3 has been announced with a bigger screen. It will also let users view messages and answer calls and ensure a better experience on the display. 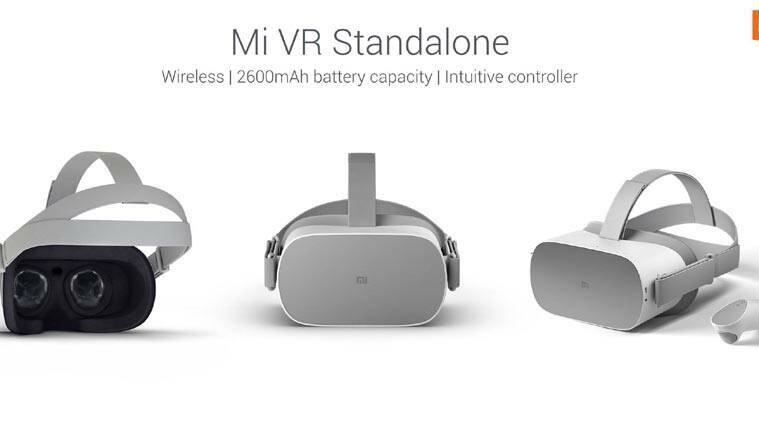 Xiaomi has also introduced a standalone Mi VR headset with a 2600 mAh battery, Snapdragon 821 processor, 2k fast switch screen, and over 1000 Oculus optimized games. This the headset in partnership with Oculus. 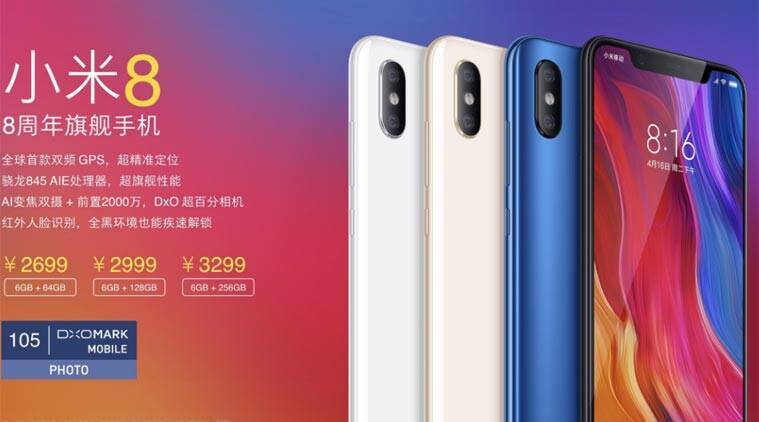 Mi 8 SE will cost Yuan 1799 for the 4GB RAM+64GB variant, while the 6GB RAM and 64GB variant will cost Yuan 1999. Xiaomi Mi 8 Explorer edition: Price details. 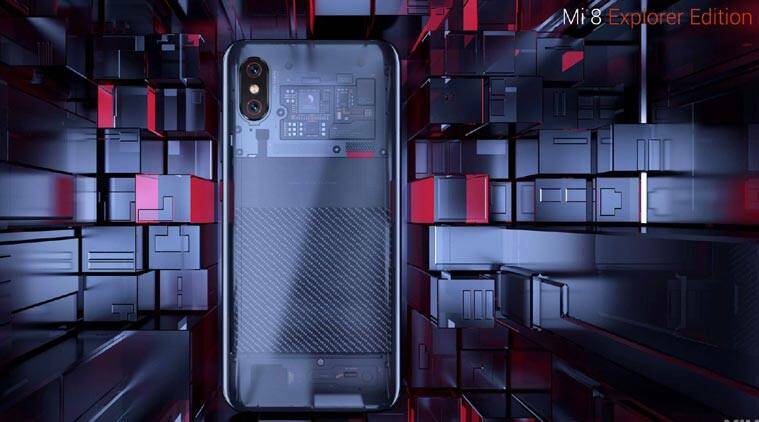 Mi 8 Explorer Edition comes with 8GB RAM and 128GB storage on board. The price is Yuan 3699, which comes is nearly Rs 38,900 plus. The Mi 8 Explorer edition sports a completely transparent back unlike the regular variant of the Mi 8 smartphone. The Mi TV 4 in 75-inches has been launched. It has a 4K HDR display, 2GB RAM 32GB storage, 64-bit quad-core processor, and an integrated voice assistant. The new television set is only 11.4-inches in terms of thickness. The Mi 8 has a 12MP+ 5MP rear camera, which also has the AI features seen on the Mi 8. The Mi 8 SE has a 3120 mAh battery on the back. The phone has a 2.5D curved glass design. It will come in Red, Blue, Gold and Black colour options. Mi 8 SE smartphone also revealed. This one has a smaller 5.8-inches display with a notch on the front. The display resolution is 2240 x 1080 pixels, 18.7: 9 aspect ratio. The smartphone is powered by a Qualcomm Snapdragon 710 processor and it has a fingerprint scanner at the back. There's also a dual rear camera at the back placed vertically like on the regular Xiaomi Mi 8 smartphone. Mi 8 has an in-display fingerprint scanner as well, 3D face recognition and a transparent back. Xiaomi Mi 8 has a starting variant of 6GB +64GB which is Yuan 2699. The 6GB RAM +128GB variant is Yuan 2999, while the 6GB RAM and 256GB storage version costs Yuan 3299. The smartphone has dual-frequency GPS. The company claims this will eliminate interference from buildings and reduces signal delays, and promises better navigation with the Mi 8 smartphone. Mi 8 will support NFC payments in China as well. It also comes with a 3D beauty feature for better pictures and this is also driven by AI. Xiaomi claims the Face Unlock feature will work in the dark. It also claims thanks to the Infrared sensor, the Face Unlock cannot be fooled by a photo or video of the peron. 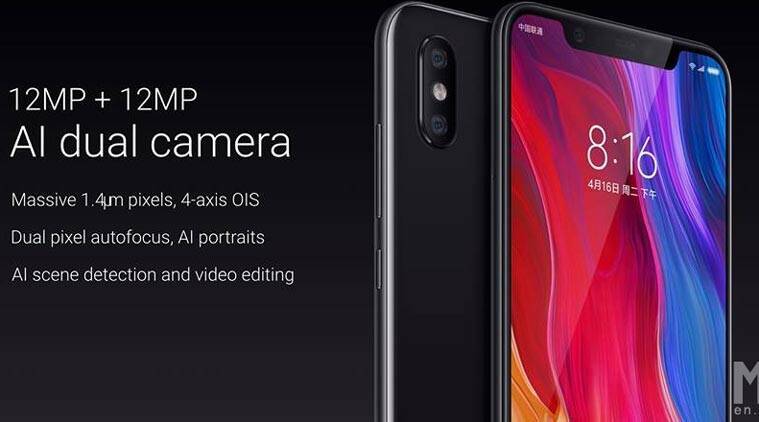 Xiaomi Mi 8 has a 20MP front camers with f/2.0 aperture and AI Portrait selfies. However, Xiaomi has also packed the notch with other sensors as well to secure the Face Unlock. 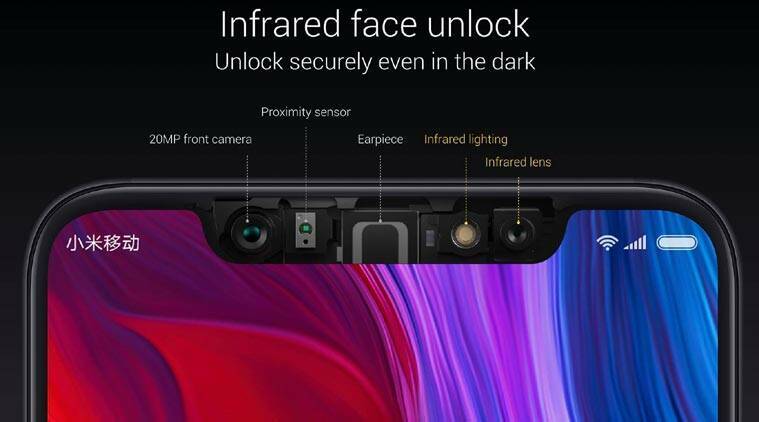 There is an Infrared Lighting and Infrared Lens for securing Face Unlock feature in the dark. The Mi 8 sports a Studio lighting photography option as well, which the company says is powered by AI. 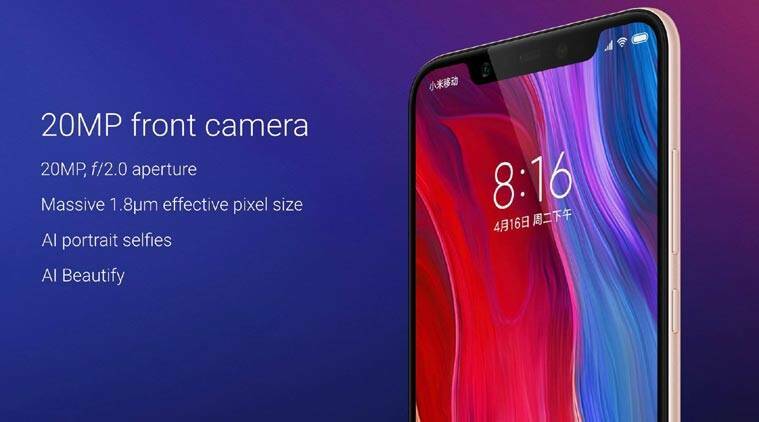 Xiaomi Mi 8 has a two 12MP cameras on the back with a wide-angle and telephoto setup. The wide-angle lens has f/1.8 aperture, while telephoto has f/2.4 aperture. The phone has 4-axis optical image stabilization (OIS) on the wide-angle module, and an LED flash. As expected, the Mi 8 has the latest Qualcomm Snapdragon 845 processor. The company is also claiming an all-time Antutu benchmark score of 300, 000 plus on the Mi 8. However, a benchmark score is not an indicator of actual performance and it can differ. Still given the Mi 8 runs the latest processor means the performance should be good. It looks like Xiaomi is following rivals like Honor, OnePlus, etc and will let users hide the notch as well . OnePlus 6, Honor 10, Huawei P20 Pro, etc also support this option. Xiaomi Mi 8 has a 2.5 curved glass. The smartphone has a 7000 series aluminium frame. It also sports a glass and metal design. The Xiaomi Mi 8 will come in white, blue, gold and black colour options. Xiaomi Mi 8 will come with a notched display. The phone has a 6.21 Samsung AMOLED display. Full HD+resolution of 2248 x 1080 pixels with a 88.5 per cent screen-to-body ratio. The aspect ratio of the display is 18.7: 9 and up to 600 nits brightness. 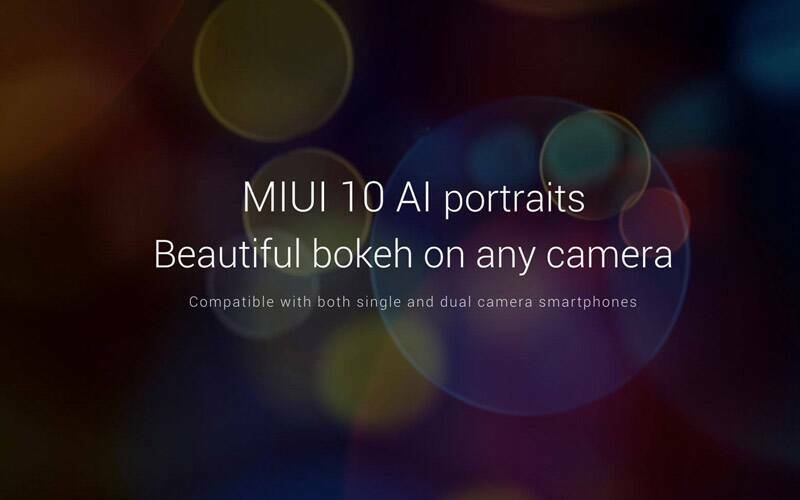 The MIUI 10 will rely on artificial intelligence to boost the 'Bokeh' features in the camera. Portrait mode will work on single and dual camera setups well as the front and rear cameras. It will also rely on AI to figure out which apps are used more by the user. MIUI 10 will have a new task manager which will take advantage of the full screen, which is taller. It maximses screen space, along with full screen space gestures. Users will be able to swipe to delete tasks and long press for more options. Xiaomi will also add new gestures to MIUI 10 given it is now opting for full screen displays across its phones. 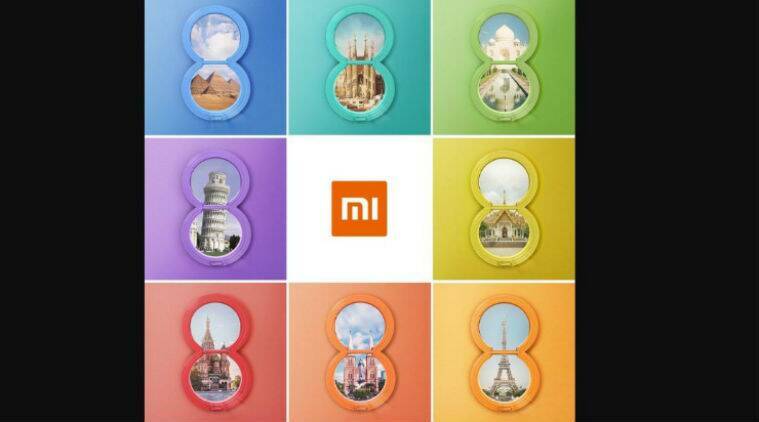 Xiaomi Mi 8, MIUI 10, Mi Band 3 launch Highlights: Mi 8 could launch in eight countries, including India. Xiaomi Mi 8 is the company's eighth-anniversary flagship, and the successor to Mi 6. The smartphone is powered by the Snapdragon 845 processor with 6GB and 64GB internal storage as the base variant. Mi 8 sports 12MP+12MP rear cameras and a 20MP front-facing camera. 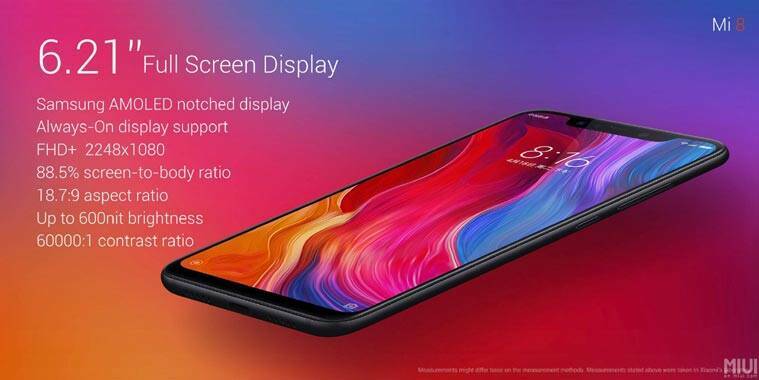 The Mi 8 also has a notched display with 18.7:9 aspect ratio. 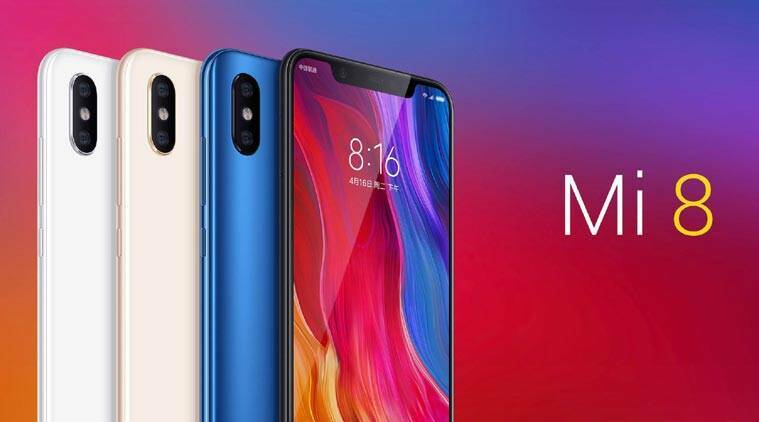 Mi 8 also comes with Animoji style features similar to the Apple iPhone X.
Xiaomi Mi 8 has a Mi 8 SE variant as well, which is more affordable with a Qualcomm Snapdragon 710 processor. There's a Mi 8 Explorer edition also with a completely transparent back and an in-display fingerprint scanner. Mi Band 3, Mi VR headset and Mi TV 4 in 75-inches have also been unveiled by the company. We will have to wait and see if Mi 8 makes its way to India or not.